Sister Dolores Quinn (M. Valerie Anne), age 90, died at Mary’s Woods at Marylhurst, August 1, 2017. Dolores, the first-born of the ten children of John Frances and Eleanor Krzmarzick Quinn, was born in Garrison, North Dakota, and moved to Oregon with her family in 1933. She received her elementary education in Catholic schools in Portland and graduated from St. Mary’s Academy in 1945. Dolores entered in July 1945 and received the name Sister M. Valerie Anne. Having grown up in a large family and remembering her mother’s love for children, she began her ministry career working with first graders, teaching at The Madeleine and St. Thomas More in Portland and at St. Mary’s, Eugene. She also served as principal at St. Mary’s, Eugene, and at St. Peter’s, Portland. During this time, she completed a master of education from the University of Portland. After studying theology at the University of San Francisco, she taught at Sacred Heart Academy, Salem. She then became a part of the Oregon Formation Team working with young women entering the Holy Names Community. Understanding the importance of early education an individual’s development, Sister Dolores returned to formal education as a co-founder of the Early Childhood Center at Marylhurst. She next moved to Bend, Oregon, where she worked in family ministry. Simultaneously she became a licensed facilitator in PRH, a process for personal growth, which brought together all she had learned about the human person and put it into a methodical approach for healing and growth. Sister Dolores was a gracious, welcoming woman with a prayerful spirit. Upon retiring, she continued to mentor individuals, accompanying them on their personal and spiritual journeys. She also worked with the women in the SNJM lay consecrated program sharing the spirituality and charism of SNJM community. 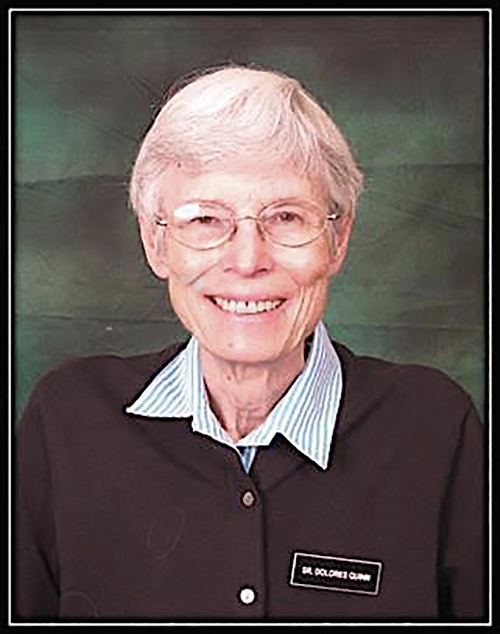 Sister Dolores Quinn, SNJM departed this life on August 1, 2017 at Marie Rose Center, Mary’s Woods, in Lake Oswego, Oregon. Sister Dolores had celebrated 90 years of life and 70 years of religious profession.